Flowers that belong to the genus Geranium are referred to as true geraniums, hardy geraniums, or perennial geraniums. You will also sometimes see them referred to as cranesbill geraniums because their seed pods somewhat resemble a crane’s bill. There is a great deal of variety in the Geranium genus, but most of the commonly grown varieties are low growing, dense, carpet-like plants with flower stalks that poke and weave through neighboring plants. The flowers float on top of the plant, in shades of white, pink, magenta, purples, and blues. The flowers are small—around 1 inch—and cupped-shaped, attracting plenty of butterflies and bees. The variety of geraniums are innumerable, which means that proper care will differ between the types. However, generally speaking, geraniums prefer full sun and a well-drained, moderately rich soil. They can handle partial shade, but become more prone to mildew if kept damp. A few perennial geraniums bloom just once, usually early in the season. Most will start blooming in mid-summer and repeat bloom sporadically throughout the growing season. Newer varieties, like 'Rozanne', bloom non-stop all summer. For the best flowering and most vigorous geranium plants, site them in full sun to partial shade. If grown in hot, full sun, provide regular water. Some varieties of geraniums can tolerate full shade, but they likely won't blossom as fully as those that have plenty of sun. Geraniums are not particular about soil pH, but a neutral to slightly acidic soil is ideal. Geraniums are a low-maintenance plant, so just water when the soil gets dry. If it's in full sun, water the plant more frequently. The plant can become prone to disease if watered overhead. Geraniums grow best in daytime temperatures between 65 degrees and 75 degrees Fahrenheit and nighttime temperatures between 50 degrees and 60 degrees Fahrenheit. Perennial geraniums that are being grown outdoors benefit from slow-release fertilizer, which will prevent leaching nitrogen when there's a strong rain. Fertilize the plants with a complete dry fertilizer, such as 10-10-10, that's applied at a rate of 2 pounds per 100 square feet of soil. Then, water the fertilizer into the ground. If you're growing the geraniums indoors, don't add fertilizer until the plant is established. Simply grow it in a nutrient-rich soil mix. Once established, you can fertilize it with a liquid fertilizer that's a 20-20-20 formula, using a rate of 2 tablespoons per gallon of water. Most species of hardy geranium live longer if divided every 3 to 5 year, though you can divide more frequently to keep them from spreading. Once you see the center dying out, it is definitely time to divide. Divide the geraniums in the early spring to early summer, giving the plant time to establish its roots before a frost. To divide the plant, dig it up and shake the soil off the roots. Use a trowel or a knife to separate, making sure that each division has a root section and leaves. Replant each divided section at the original depth, and water the plants well. Geranium endressii 'Wargrave Pink': The most commonly grown geranium with salmon pink flowers, it grows 18 to 24 inches tall in zones 3 to 8. 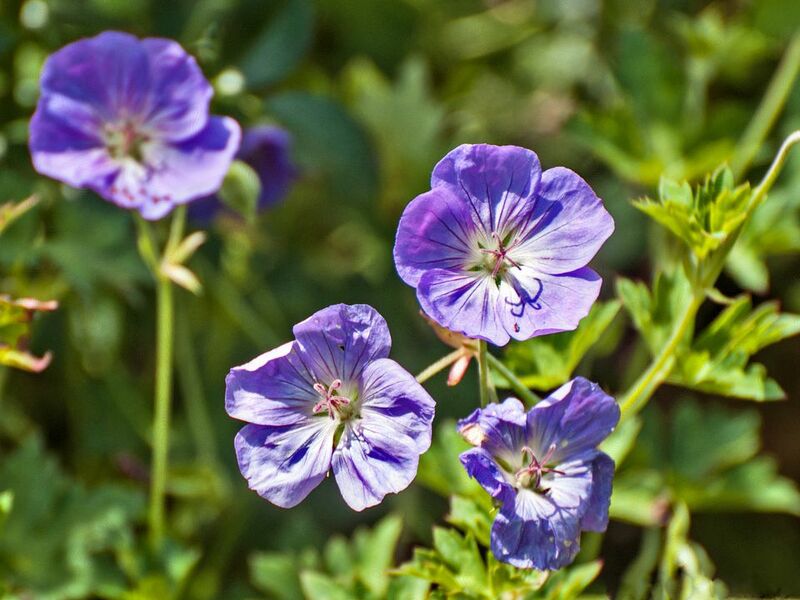 Geranium endressii 'Rozanne': A violet-blue hybrid that flowers almost non-stop throughout summer. it grows 18 to 24 inches tall in zones 5 to 8. Geranium endressii 'Ann Folkard': This is one of the earliest blooming geraniums with magenta flowers that repeat bloom throughout the season. It has a trailing habit and grows 6 to 8 inches tall in zones 5 to 9. Geranium endressii 'Double Jewel': Double-white petals feature a lilac center. It’s short and perfect for containers, as it grows 10 inches tall in zones 4 to 8. Geranium oxonianum 'Southcombe Double': Double, pure pink blooms resemble fluffy asters. It grows 10 inches tall in zones 4 to 8. Hardy geraniums require little care, once established. The plants can get a bit scraggly after blooming and deadheading is difficult with so many wispy stems. Shearing the plants back to basal growth will improve their look and encourage reblooming. The plants fill back in within weeks. The exception is Geranium macrorrhizum, which is easily deadheaded and needs no shearing. The shape of the flowers: Geraniums have symmetrical flowers with 10 fertile stamens; Pelargonium have bilaterally symmetrical flowers with seven fertile stamens. Seed dispersal: Geraniums fling their seeds away; Pelargonium seeds float away on a breeze. Stem appearance: Geraniums have slender stems; Pelargoniums have thick, succulent stems. Slugs may attack young geranium plants, while mildew and rust can infest foliage, especially in partial shade and/or humid climates. Shearing back and disposing of the infected leaves will help.